1. 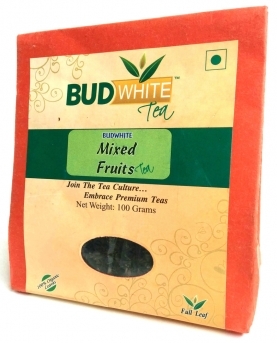 Whole leaf Black tea grown in organic tea gardens, having rich aroma, flavored with 100% natural flavors of four fruits. All four flavors are quite distinct, and satisfy the taste buds of all. The ice teas made using Mixed Fruit teas are also quite popular. Black tea blended with 100% natural flavors of Sweet Orange, Black Currant, Raspberry, Pineapple, Strawberry, Mango, Orange (Any four flavors).